I have to be honest, I’ve never really given Kmart’s shoe department a look except for those times when I was after throw-away joggers for various mud or colour runs. I already have my staple ‘investment’ shoes, the comfortable old Converse I actually wear most days and an embarrassing collection of ‘one-off’s’ purchased as essential to a single outfit I never wore again. 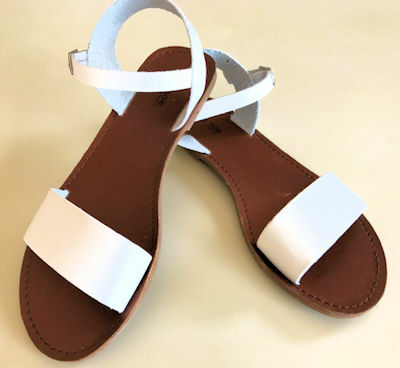 I have noticed some lovely little sandals on the models in the current Kmart summer clothing catalogue so I decided to swing by that area on a recent shopping expedition. What a pleasant surprise that was! 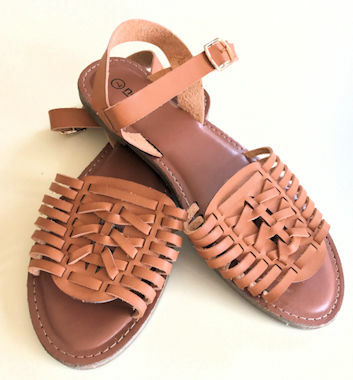 I managed to get myself 3 casual pairs of sandals – ideal for our upcoming trip – for the grand total of just $28! The boho-style open toe sandals were the most expensive of the three at just $12.00. They have a gold buckle which was easy to deal with (unlike the expensive shoes I wore in store and had a heck of a time leaning over struggling with the micro-sized buckle holes). The shoe comes in black, brown and white. These shoes are replacing a much-loved pair of ‘investment’ strappy black flats due for retirement so I have high hopes for them. Like their predecessor, I find I can slip them on and off without ever having to undo the straps, which I just love. 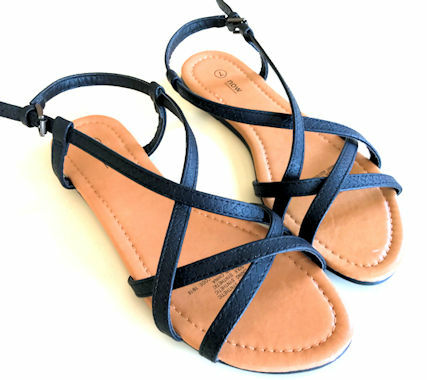 The straps feature a subtle ‘braided’ texture all over which gives an added dimension to the simple sandal. This style in available in either black or beige. I haven’t had a chance to wear these yet so I’m unsure how comfortable they are for all-day wear. What I do know is they are super cute and so, so affordable. The Y-Back style comes in several colours: black, tan and white. I must confess, I do not relish shoe shopping (Gasp! I know… how very un-female of me) but I do love a bargain! I practically skipped out of the store, riding high on the bargain buzz. Yes, they are all synthetic materials (something I normally avoid) and may well fall apart after just a season, but considering the price, I’d still be happy with them. Let’s face it, we probably all have at least one pair of shoes we paid a small fortune for which never hit the floor more than once. If I can get a season out of these, I’ll be thrilled.